There isn’t a whole lot about Bowser’s family in the Mario series. Even his seven kids have been retconned into not really being his children, which raises the question as to where they come from. 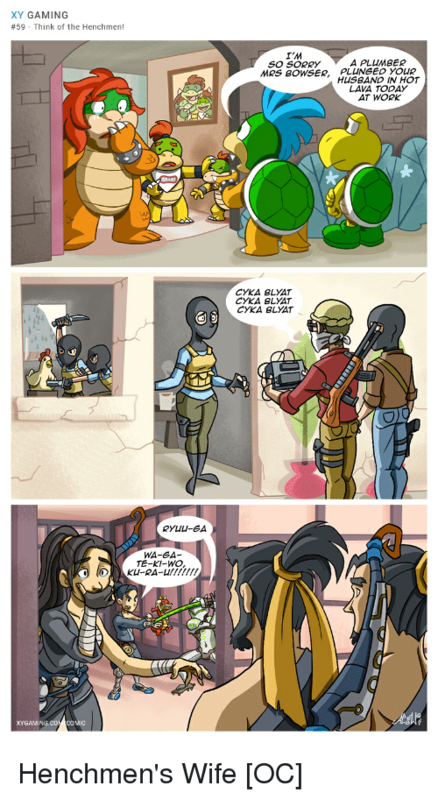 We never knew their mother anyway, or Bowser Jr.’s mother. I’ve seen speculation that the Koopalings’ real father is named Morton, in order to explain Morton Koopa Jr. The name was really given to make the reference to Morton Downey Jr. more obvious, but that’s not necessarily an in-universe explanation. I always wondered why Morton was an exception to the rule of the Koopa Kids being named after musicians, but Downey was a singer and songwriter for some time before becoming a trashy talk show host. The actual exception is Larry, who despite rumors that his name referenced Larry King or Larry Mullen Jr. of U2, the guy who named them later said he just looked like a Larry. Morton’s name in the cartoons was Big Mouth, and Downey was fond of the term “loudmouth” and his show’s logo was a mouth, so that’s probably not a coincidence, right? The general theory for the renaming of the Koopalings was that they didn’t have official names when the show was being made, which is possible, but both that and the fact that Ludwig von Koopa became Kooky von Koopa (did two people really independently decide he should have that “von” in there?) suggest otherwise. Oddly, I understand that Paper Mario: Color Splash makes Morton monosyllabic, the complete opposite of his character on the cartoon. Maybe he’s under some sort of curse by a family member who was sick of hearing his mouth. 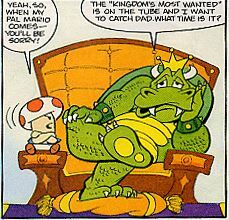 Bowser originally told Jr. that Princess Peach was his mom, but he later admitted he lied, and Jr. was aware of this. Shigeru Miyamoto has claimed that HE’S Jr.’s mom, which I guess is true in a weird way. I guess you don’t even necessarily need two parents when storks bring the babies, and Jr. could even be a clone considering that he’s pretty much identical to Baby Bowser. There’s a popular rumor that a British Nintendo magazine suggested the name Clawdia for Bowser’s wife and the Koopalings’ mom, but the original text has never been located, and it appears to actually come from a fansite called Lemmy’s Land. 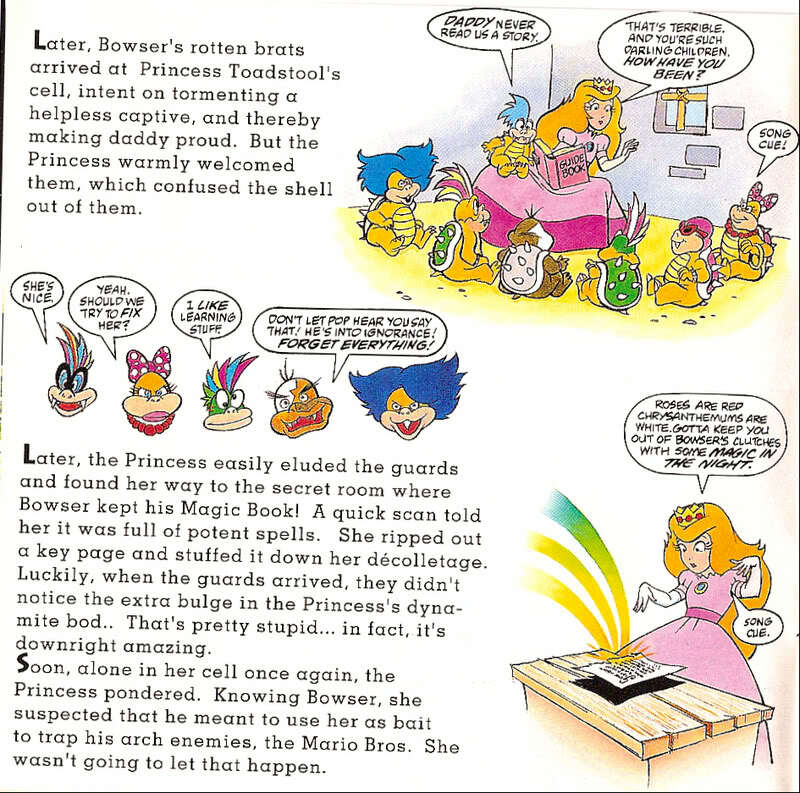 I do seem to recall, perhaps in one of the Nintendo Comics System books, an answer to a question about the Koopalings’ mother that said she might be on a long visit to her parents, but I don’t think it gave a possible name for her. 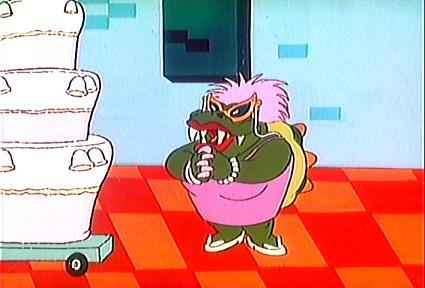 I’ve mentioned before that one of the Super Mario Bros. Super Show cartoons, “Do You Princess Toadstool Take This Koopa?”, had an appearance by Bowser’s mother, an overbearing woman who was glad her son was finally getting married. Does that mean that he hadn’t been married before, or am I being too nitpicky? And one of the comics suggests that his father is a criminal on the run. While neither is canonical, I do find it interesting that both parents are accounted for in a non-contradictory way, which I seriously doubt was planned. Bowser appears to have mostly been raised by Kamek, as per the Yoshi games. Another Super Show episode had King Koopa mention a grandfather named Poopa La Koopa, whose motto was “Cheat, beat, and be merry.” Perusing Super Mario Wiki has also alerted me to two other possible relatives, in this case siblings. Worlds 8-4 and 9-3 of the Japanese Super Mario Bros. 2, eventually released in the States as The Lost Levels, feature a character who’s a pallet swap of Bowser, blue where the real Koopa King is green. While similar to the fake Bowsers, he doesn’t change form when defeated with fireballs, meaning a blue Koopa presumably IS his real form. A Japanese encyclopedia actually referred to him as Bowser’s brother. 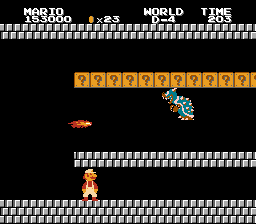 The Blue Bowser does not appear in the Super Mario All-Stars version of the game, although his replacements still don’t turn into anything else when killed with fireballs. I don’t think his being the King’s brother was ever official anyway, but I still like the idea. Then there’s an album released in 1991 where Bowser mentions a sister, but I should probably back up a bit and describe the medium. Called White Knuckle Scorin’, it was an officially sanctioned Nintendo product intended to promote literacy, with songs by various artists including Crosby Stills & Nash, Roy Orbison (I wonder if whoever put the project together realized he was Roy Koopa’s namesake), Dire Straits, and Sheena Easton. The only song on it actually related to Mario is the first one, “Ignorance Is Bliss,” by the power pop band Jellyfish. The lyrics are mostly from the point of view of Bowser, and he mentions his sister got a blister on her brain from reading too much. Because if the villain hates reading, it must be cool, right? It was accompanied by a short comic telling a fairly basic story of Mario, Luigi, and Yoshi rescuing the Princess from Bowser, but told sarcastically and with references to reading being awesome, and with the songs tenuously tied in by having the characters say their titles. It’s a rather weird source, but hey, why CAN’T Bowser have a bookworm sister? After Mario beats him, Bowser Jr. restores him to full life with a magic potion. But then he reappears in later titles alongside Bowser, so he’s presumably someone different. 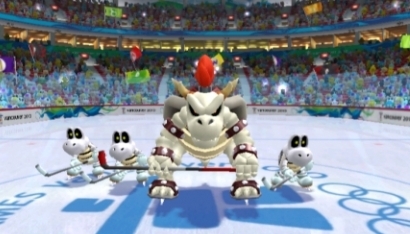 Okay, if everyone can apparently bring their infant selves into the present to play sports, it’s only fair that the Koopa King could bring an alternate undead version of himself, sense be damned. 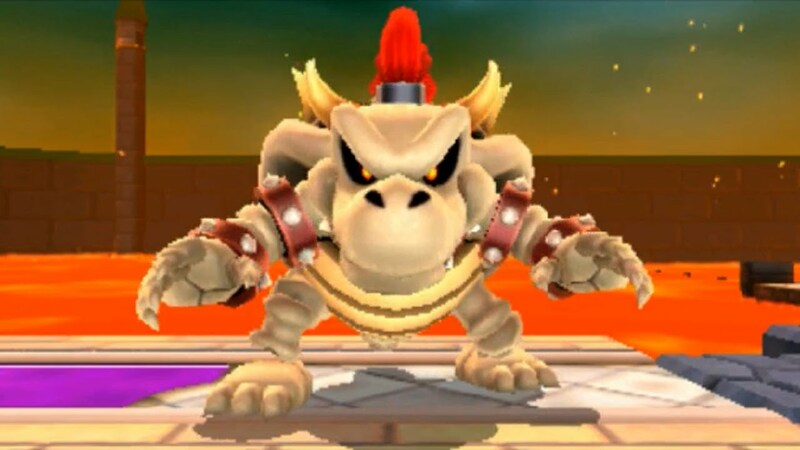 In one of the Mario Party games, however, Bowser refers to Dry Bowser as a close family friend. Hey, maybe that’s what happened to Blue Bowser. The picture I posted at the top of this entry suggests he could actually be Bowser’s father. This entry was posted in Albums, Cartoons, Comics, Families, Mario, Music, Super Mario Bros. Super Show, Television, Video Games and tagged blue bowser, bowser koopa jr., dry bowser, jellyfish, kamek, king bowser koopa, larry koopa, larry mullen jr, ludwig von koopa, mario party, morton downey jr., morton koopa jr., new super mario bros., nintendo, nintendo comics system, paper mario color splash, princess peach toadstool, roy koopa, super mario bros. the lost levels, white knuckle scorin'. Bookmark the permalink. Not that similar to her portrayal in the Super Show, but apparently both were agreed on the idea that she looked like Bowser with a wig and glasses.